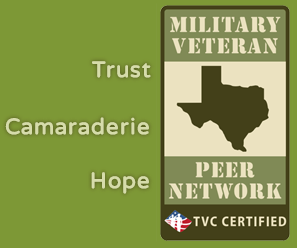 MEMBERS OF THE MILITARY VETERAN PEER NETWORK. Bring Everyone In The Zone, Inc. is a 501(c)3 non-profit that helps Service Members, Veterans and their Families. Our program covers three main areas, Preparing, Caring and Sharing (PCS). The members of our Board of Directors have served in the military since the Viet Nam era and forward. They are dedicated to helping their fellows to get back "IN THE ZONE". Next Board of Director Meeting is scheduled for February 21, 2019 at 204 Priest Drive, Killeen, TX 76541 at 1000. Our Purpose: We provide Peer Support in a myriad of ways to Service Members, Veterans and families (SMVF), especially those suffering from Post-Traumatic Stress, Traumatic Brain Injury, Military Sexual Trauma and other traumatic events in their lives. We help make improve the quality of life for the SMVP. Our Mission Statement: To provide education and support to SMVF who are experiencing the devastating effects of Post-Traumatic Stress Disorder.To train facilitators in recognizing cases that require additional services including but not limited to medical referral and providing them with needed resources. Our Core programs and services:Preparing, Caring (includes Operation Resilient Families) and Sharing,. We train volunteers to be facilitators, we assist our target population w/benefits, we develop resources, we help with basic needs, we hold Peer Support Groups. We provide resiliency training to families. Our activities include everything necessary to assist service personnel and their families who are suffering.These activities include, but are not limited to: screening; intake; orientation; assessment; treatment planning; counseling; case management; crisis intervention; client education; referral; reports and record keeping; and consultation. See Sharing Page for locations of Groups near you. See Preparing Page for Basic Facilitator Training and Mental Health First Aid schedule. © Copyright 2009,Bring Everyone In The Zone.